In the year 1776. 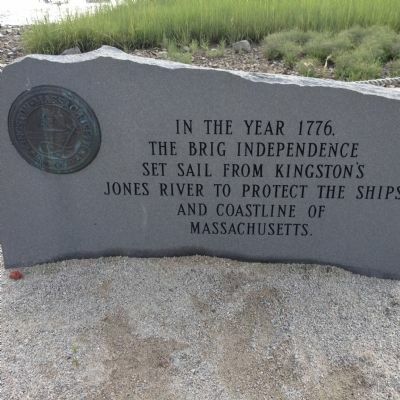 The Brig Independence Set sail from Kingston's Jones River to protect the ships and coastline of Massachusetts. Location. 41° 59.89′ N, 70° 42.625′ W. Marker is in Kingston, Massachusetts, in Plymouth County. Marker is on River Street. Touch for map. Marker is in this post office area: Kingston MA 02364, United States of America. Touch for directions. Other nearby markers. At least 8 other markers are within 4 miles of this marker, measured as the crow flies. Site of The First Church (approx. 2.2 miles away); America's Oldest Maintained Cemetery (approx. 2.2 miles away); The National Monument to our Forefathers (approx. 3.2 miles away); Welcome to Pilgrim Memorial State Park (approx. 3.6 miles away); America’s Hometown at the Heart of Plymouth County (approx. 3.6 miles away); The Old Powder House (approx. 3.7 miles away); Powder House (approx. 3.7 miles away); Major William Bradford (approx. 3.7 miles away). More. Search the internet for The Brig Independence. Credits. This page was last revised on June 16, 2016. This page originally submitted on July 15, 2015, by Chris Connors of Tisbury, Massachusetts. This page has been viewed 217 times since then and 13 times this year. Photo 1. submitted on July 15, 2015, by Chris Connors of Tisbury, Massachusetts. • Bill Pfingsten was the editor who published this page.